In one click, tell where you are. Tap the application icon: the application will find your position, will try to get your address and will send an email for someone you want to know where you are. Just arrived at the airport and want to inform your spouse? Tap HereAt and wait that the email will be sent! You're traveling and wants to reassure your family when you arrive at your dest? - Just one Tap! The person receiving the email can see the city you are and can click a link to see your position in a Map. 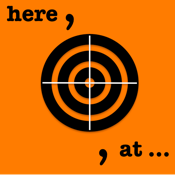 ➤ You will need to enable Location Services for HereAt. ➤ HereAt requires a network connection to get your address and to automatically send the email. ➤ Even without network connection, HereAt can find your position (through GPS) and to put the email to be sent in your outbox.